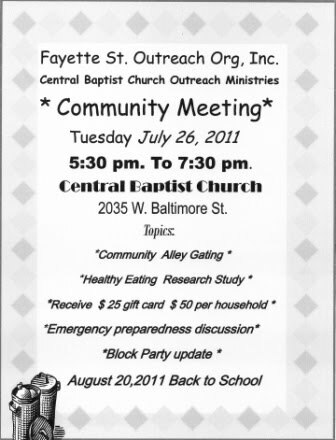 Welcome to the Fayette Street Outreach site! Created in 1994 by a group of residents who at the time were fed up with the drug and sanitation problems that plagued their Southwest Baltimore neighborhood, the Fayette Street Outreach Organization (FSOO) was established. FSOO’s boundaries stretch from Mulberry Street to the north to Monroe Street to the east, Warwick Avenue to the west and Baltimore Street to the south and all of the streets in between. Fayette Street is in the center of the organization’s geographic boundaries. Our mission is to (1) build a better, safer, and healthier community for our residents; (2) build a brighter future for our youth; and (3) work toward a better tomorrow for all.